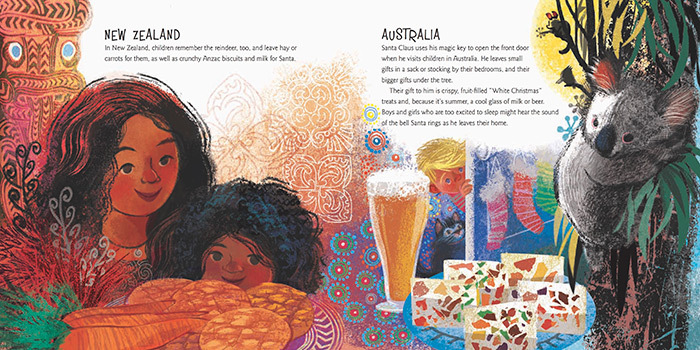 A World of Cookies for Santa: Follow a Tasty Trip Around the World by M. E. Furman and illustrated by Susan Gal looks and reads like a book that has been around for decades. 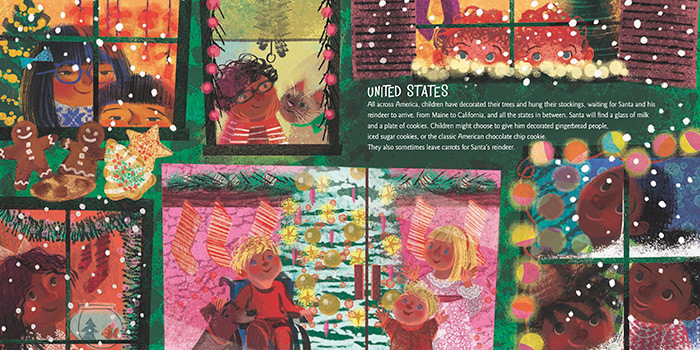 How is it possible that no one has written a picture book about holiday cookie traditions from around the world before now? 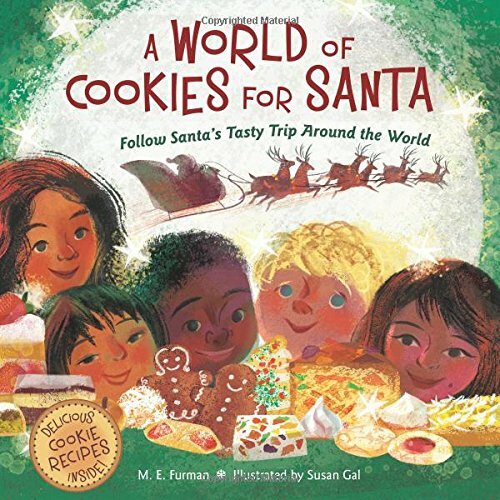 Happily, Furman and Gal have done a marvelous job making A World of Cookies for Santa more than just a picture book - geography, world cultures and recipes are also part of this magnificent book. And, if you fall in love with this book like I did, there is a website with even more cookies, people and places - World of Cookies for Santa! A World of Cookies for Santa: Follow Santa's Tasty Trip Around the World begins on Christmas Island, the first place in the world to welcome Christmas Day, and ends in Hawaii. But first, an introductory paragraph lets readers know that Santa Claus has many names and the children of the world have many different cookies they treat him with. In her author's note, Furman also tells readers about "unique gift-bringers" in addition to their own versions of Santa Claus, like La Befana in Italy. Furman's text is perfect - informative, brief and fascinating. Furman also provides translations when appropriate, like letting readers know that the Danish word Julemande means Christmas Man. 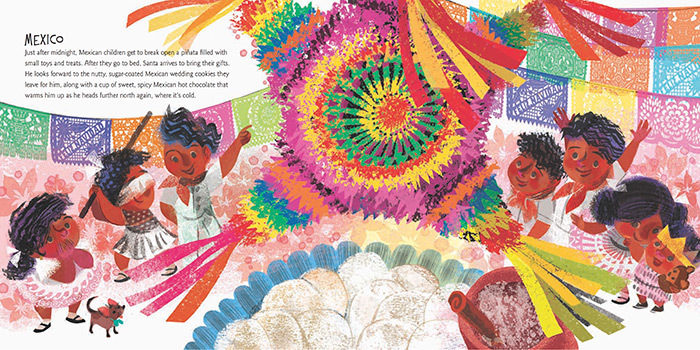 With her slightly 1960s feel, Susan Gal's illustrations are superb and packed full of details. 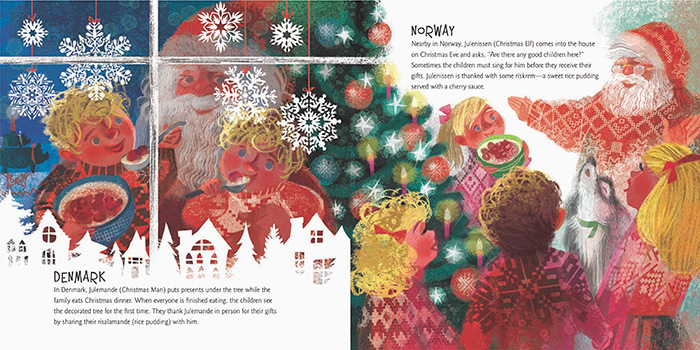 Of course the cookies and the children of the country are at the center of each illustration, but Gal also includes the traditional decorations of each country and culture as well was images of their Santas from time to time. Best of all, endpapers start the book with a map of the world with Santa's (and the book's) flight path on it and ends with the same map of the world, this time with each stop numbered and, bordering the map, the cookies from each country with corresponding numbers. Furman includes nine cookie recipes at the end of the book and more on her website. A World of Cookies for Santa is THE PERFECT gift for any young aspiring baker or cookie eater, especially one who likes to leave treats for Santa. I suggest you buy a few copies of A World of Cookies for Santa because it just might get a few ingredients on it when you prop it up on the counter while baking the Coconut Macaroons from Christmas Island, the Puto Seko from the Philippine Islands, the Mantecaditos from Puerto Rico or the Eskimo Cookies from Alaska!